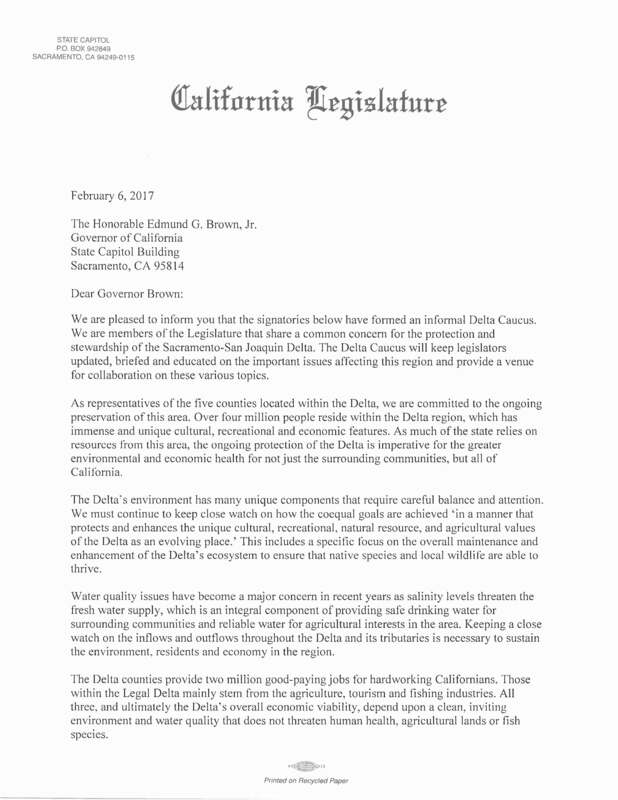 SACRAMENTO – Today, Assemblymember Jim Frazier (D – Oakley) and Senator Bill Dodd (D – Napa) sent a letter  to Governor Brown proudly announcing the formation of a Legislative Delta Caucus. The Delta region is composed of five counties and home to over four million Californians. The Caucus will allow legislators to maintain a more united voice on important issues affecting this region by keeping them updated, briefed and educated while also providing a venue for collaboration with various public and state entities. The members of the Caucus include Senator Galgiani, Senator Glazer, Senator Pan, Assemblymember Aguiar-Curry, Assemblymember Cooper, Assemblymember Eggman and Assemblymember Grayson with Senator Dodd and Assemblymember Frazier serving as Co-Chairs. 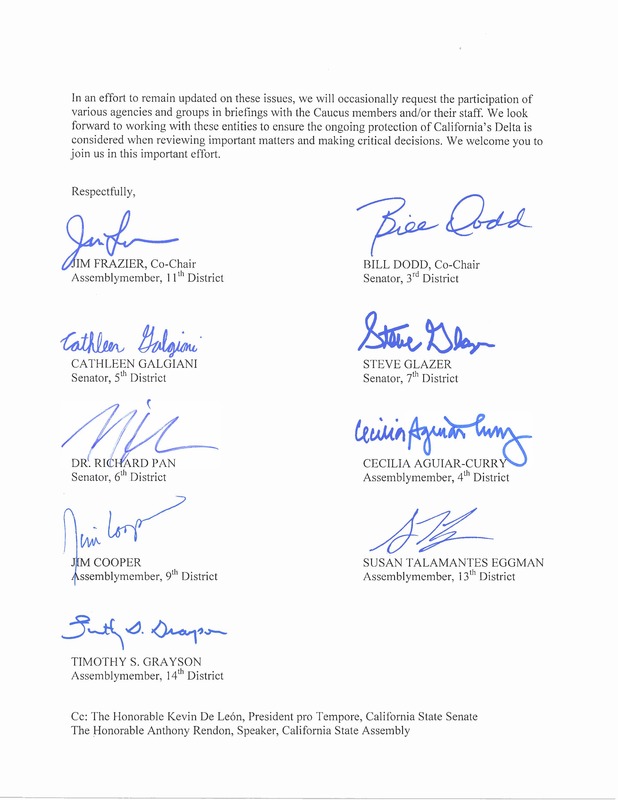 We are pleased to inform you that the signatories below have formed an informal Delta Caucus. We are members of the Legislature that share a common concern for the protection and stewardship of the Sacramento-San Joaquin Delta. The Delta Caucus will keep legislators updated, briefed and educated on the important issues affecting this region and provide a venue for collaboration on these various topics. As representatives of the five counties located within the Delta, we are committed to the ongoing preservation of this area. Over four million people reside within the Delta region, which has immense and unique cultural, recreational and economic features. As much of the state relies on resources from this area, the ongoing protection of the Delta is imperative for the greater environmental and economic health for not just the surrounding communities, but all of California. The Delta's environment has many unique components that require careful balance and attention. 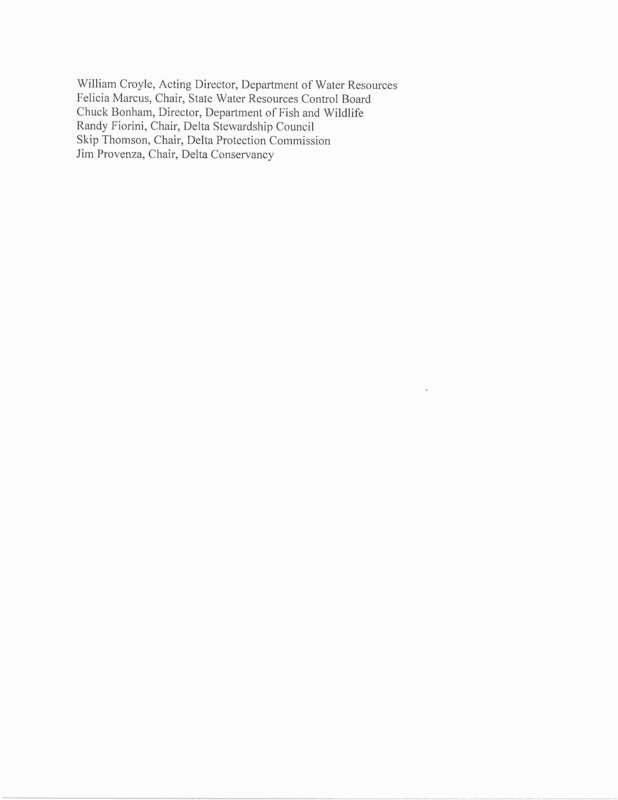 We must continue to keep close watch on how the coequal goals are achieved 'in a manner that protects and enhances the unique cultural, recreational, natural resource, and agricultural values of the Delta as an evolving place.' This includes a specific focus on the overall maintenance and enhancement of the Delta's ecosystem to ensure that native species and local wildlife are able to thrive. Water quality issues have become a major concern in recent years as salinity levels threaten the fresh water supply, which is an integral component of providing safe drinking water for surrounding communities and reliable water for agricultural interests in the area. Keeping a close watch on the inflows and outflows throughout the Delta and its tributaries is necessary to sustain the environment, residents and economy in the region. The Delta counties provide two million good-paying jobs for hardworking Californians. Those within the Legal Delta mainly stem from the agriculture, tourism and fishing industries. All three, and ultimately the Delta's overall economic viability, depend upon a clean, inviting environment and water quality that does not threaten human health, agricultural lands or fish species. In an effort to remain updated on these issues, we will occasionally request the participation of various agencies and groups in briefings with the Caucus members and/or their staff. We look forward to working with these entities to ensure the ongoing protection of California's Delta is considered when reviewing important matters and making critical decisions. We welcome you to join us in this important effort.